You can print any story in Storypark, which is especially useful for teachers wanting to make physical copies for a child's portfolio. On any page that shows stories as a series of tiles (ie. a child’s ‘Stories’ page), click the story you want to print and in the story window, click the ‘Print preview’ button in the blue bar at the top of the screen. Clicking 'Print preview' will open a print preview page in another window that lets you choose how the page should look when it prints. In the grey side bar you'll see various formatting options. You can choose the layout you'd like to use. You can also make the text in the story bigger (+) or smaller (-), the images bigger (+) or smaller (-), or turn on and off the story content, comments, learning tags, title, date or author at the bottom of the story. Experiment with the various options until you are happy with the result. Then click 'Print story'. Be sure to check out our help centre article on setting up your browser for printing. 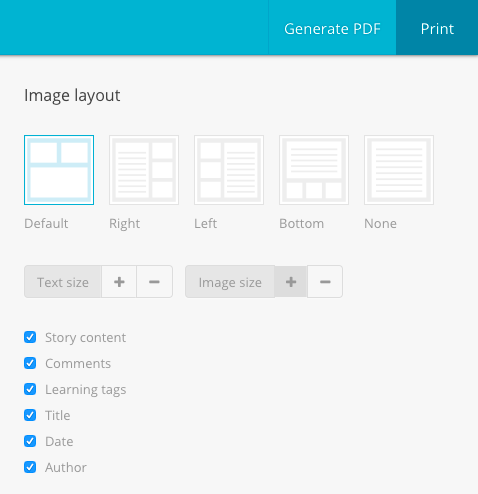 You're also given the choice to download the story as a PDF ('Generate PDF').